1Will my life change in 2019? 1.1.44. Capricorn – You’ll become more daring! 1.1.55. Pisces – Positive change is on the horizon! 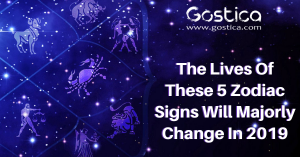 2019 horoscope already suggests that 2019 is set to be a year of big changes in all aspects of your life. For some zodiac sign things will change for the positive, whereas for other zodiac signs the changes in 2018 will be negative. What about your zodiac sign? Will your sign be lucky in 2019? Will your zodiac’s life change in 2018 and be turned upside down? We reveal all! Will my life change in 2019? For these 5 zodiac signs, things may never be the same again! This year is going to be one hell of a rollercoaster! Say goodbye to your boring routine, Taurus your life is going to change and you will uncover a new side of yourself in 2019. You’ll be more confident and be more daring, especially when it comes to love! This year, your passion and energy will spice up your usual mundane routine! 2019 is a year when hard work will pay off for you with May to September the time to put most effort in, to gain the reward. Changes do exist within your financial area of life though beginning in April and continuing until June. Relationships work best with those born under the other two Earth signs in 2019. Those born 4-6 May and 26-28 April are likely to find this an important year in all partnerships and joint affairs. To gain your objectives for this year will be better if you were to be working in with a solid support group, a preparatory phase exists before June, which you can benefit by if you complete some earlier study or hone your skills in this time. In May and June 2019 a new direction beckons. Working solidly from early February to early June brings benefits to you. For you, 2019 is a year of understanding and realization. You’ll finally take the necessary steps to achieve your dreams! It might not always be a smooth ride, so as someone who is used to everything going their way,, this might not always be easy to deal with. In any case, these changes will only be a good thing, and will allow you to find true love! The first few months are more focused on friends and relationships, both love and financial, and you can have a few surprises coming in early in the year through another person. From late June to October is the most productive phase for personal development, you have more energy and drive in general here. Planets in signs either side of you Cancer or Virgo hold the key this year. Your personal driving period of the year does not begin until late June and lasts until early October. You have more energy and enthusiasm in general for life and can set your sights a bit higher now. Those born 11-17 August are in a major growth phase this year and late August onwards you reach a goal. For someone normally so shy, this year you will come out of your shell! You’ll finally let go of your fears and worries and take control of your life. It’s time to steer your own path and remember that life is what you make it. Why not start that a new career that you’ve been dreaming of for so long, or leave a partner that you’ve stopped loving. The future is yours. 2019 has all the cosmic ingredients for a special year for those born under Virgo, both in personal growth and through partnerships and relationships. Change has already been felt in this area since about September 2018 and will continue this year. An ideal year for marriage, or increase through some union, and many in this sign will become parents or give birth to some new ideas. Until May there is a need for some restraint or putting in some framework, and from then until September a period of increase enters your life. You may need to keep a watch on the scales and your diet through August/September. Belief in yourself and an improving attitude to life is where your best opportunities exist. Jupiter will remain in your sign until late September 2019 and will bring benefits to you, if you want to move ahead in your life. Some additional luck is also around you in the middle of the year. 4. Capricorn – You’ll become more daring! It’s also a big year for you, Capricorns. You’ll feel invincible and nothing will scare you. In both love and work, you’ll go down paths that you previously wouldn’t have dared to. Once a lone wolf, now you are looking for companionship and are no longer scared to open up your heart. You may begin this year with some uncertainty in your life, because of a decision that could not be made in December 2018. From 6 January to 6 February the decision occurs or you make up your mind over some matter. Relationships and dealing with other people, especially if they are of a different age group to yourself can be a testing area for much of this year. For those involved with joint partnership issues be aware that from early March until November you can move forward in most of these affairs, but maybe not before. Important lessons come in from others through May to August. Overall many of the planets sit in complementary angles to your sun sign this year and you are likely to find this opens up communications around you. 5. Pisces – Positive change is on the horizon! As an intuitive Pisces, you probably already know that 2019 will be a year of changes! You’re therefore already ready to put your doubts and fears aside to achieve your dreams. You won’t let anyone walk all over you anymore! Even if it means being more forceful than you’re used to, you will leave your shy side behind you. Many new and unusual events can occur for those born under Pisces in the year of 2019. You yourself may be somewhat restless and seeking new experiences or want to break up areas where routine has stifled individuality. You could even display some rebellious tendencies, especially if other people try to put restraints around you – June is such a time. Relationships can be an area that you gain great enjoyment and enlightenment from, with early May presenting you with an opportunity from someone far away. Important joint decisions are made in August and September. This year you need to be true to yourself and follow some unique ideas you have as for your life to remain the same can only lead to you taking some rebellious action mid-year. From mid-January until mid-March you have many planets to assist you in new areas of your life – you are supported and feel that this is your time to promote your ideas. Those born 19-27 February will find their lives most affected by change this year. as an A and E territory from talking on Facebook to aliens. I am leaving to the upper class sharp game worlds in cancer, scorpio, and pisces. Munch your cooked apple! Nom Nom Nom…. What do you mean by “Jupiter will remain in your sign until late September 2019” in Virgo section? Jupiter is in Saggitarius. Thank you for the detail prediction. Do you have consultant service?